We act as credit brokers and we are not a lender. †Includes £1,000 Deposit Allowance Paid By Manufacturer. *Excess mileage charge of 8p per mile. If you exceed this annual mileage then excess mileage charges will be applied by the finance provider at the end of the agreement should you choose to return the vehicle. Finance subject to status. A guarantee may be required. Terms and conditions apply. Unless otherwise stated, metallic paint at extra cost. Library image for illustration purposes only. Renault's fourth generation Megane family hatchback is now a smarter proposition - in more ways than one. If you're shopping for something Focus or Astra-shaped in this segment, it'll probably no longer be one of the first cars you'll immediately think of, but this MK4 model is clever, sensible and very good looking, with the bold exterior styling matched by the cleverness of the fresh platform that lies beneath. In short, it might surprise you. Ordinary family cars can no longer be ordinary. People want polish these days, a smarter feel and hi-tech features that make them feel pampered and premium. Which means that in the Focus-sized family hatchback segment, they may well find themselves looking at cars like this one, Renault's latest fourth generation Megane. This more sophisticated design these days has a more mature look to match seriously grown up technologies under the skin. Luxury car touches such as a massaging drivers' seat and full colour head up display merge with sub-100g/km CO2 emissions to make for a very interesting package. With the French maker's position as one of Europe's biggest car makers severely under threat and a slimmed-down range of conventional models forced upon dealers by this brand's commitment to electric power, it's hard to over-state the importance of this car if you happen to run a showroom with the yellow-backed silver diamond above the door. As with the vast majority of cars such as this, a big part of the driving experience will depend on the engine you've plumped for. 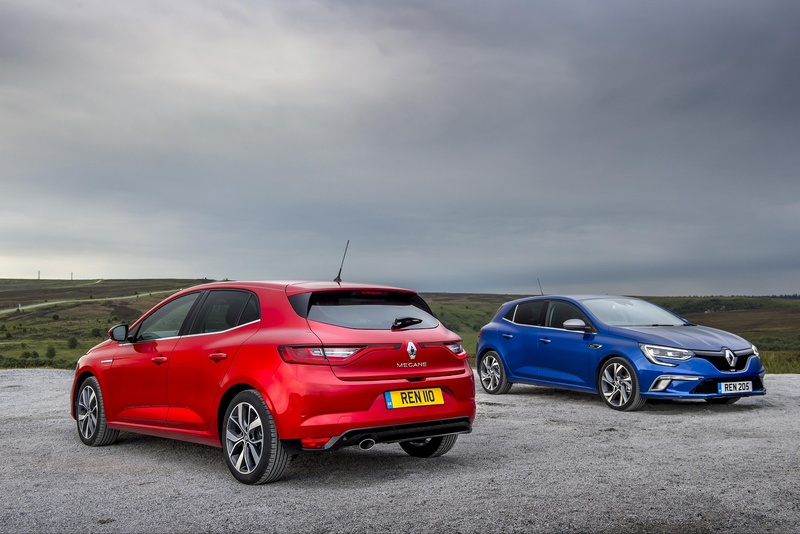 The mainstream Megane range is based around just two engines, a 1.3-litre Tce 140 petrol unit and a 1.5-litre Blue dCi 115 diesel. Both come with the option of dual clutch EDC auto transmission. 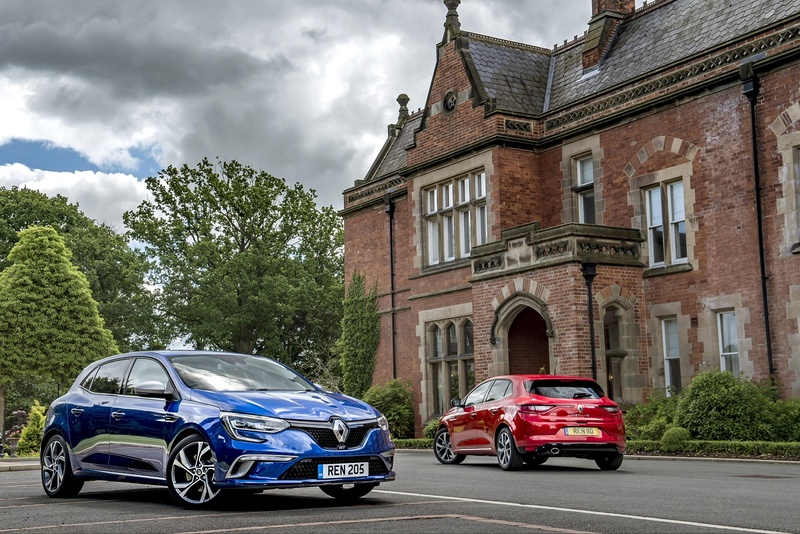 At the top of the range, the flagship Megane R.S. hot hatch uses a 280hp 1.8-litre petrol turbo unit. 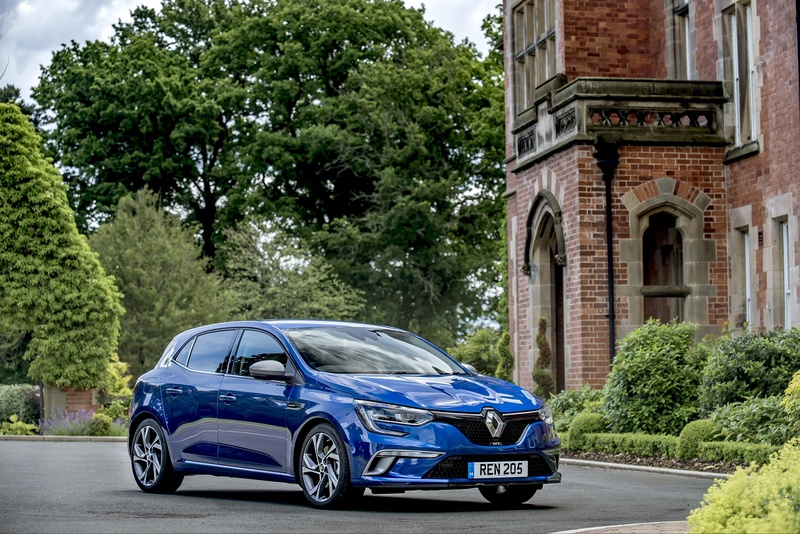 On the road, all versions of this Megane are precise and responsive while still being supple and comfortable thanks to extensive work on the suspension dampers, bump stops and bushes as well as the steering. Refinement is also significantly better than wth previous models, thanks to a stiffer body shell, thicker window glass, improved door seals and greater use of foam and felt in areas where road, wind or powertrain noise could be transmitted into the cabin. A more individual driving experience is offered by Multi-Sense technology, which allows drivers to personalise the accelerator pedal and engine response, engine sound, steering weight and interior lighting ambience through a choice of five colours, plus - where fitted - the speed of the gear changes through the Efficient Dual Clutch (EDC) auto gearbox. 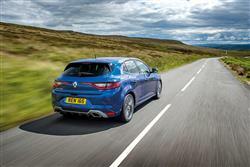 The fourth generation Megane is longer, lower and wider than its predecessor to give a more assured stance on the road. Helping give the impression of width are pronounced wheelarches similar to those on a Clio and striking light graphics front and rear. These scribe a 'C' shape up front, with the rear lights barely separated by the centrally mounted Renault badge. This echoes the large diamond logo up front with a typically large grille surrounding it. 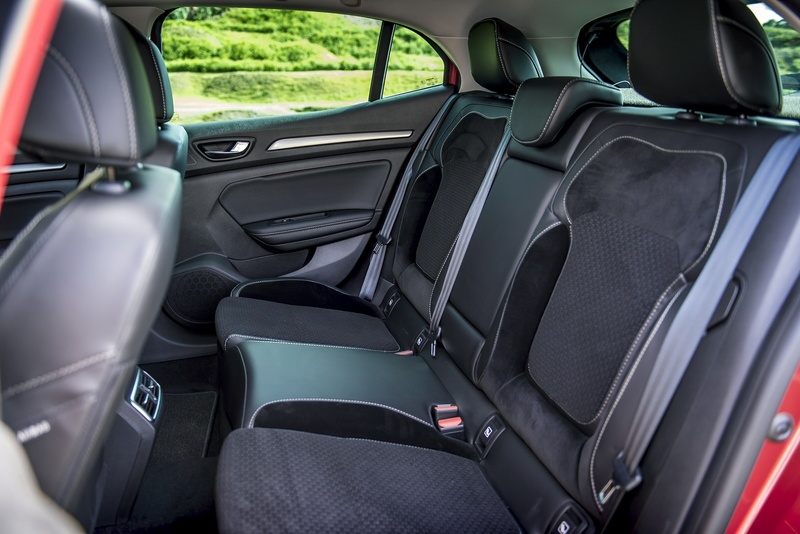 Step inside and you'll find a step up in quality compared to the previous generation car, with a distinctly Germanic feel to the ambiance. Higher end versions get a smattering of chrome trim, along with Nappa leather trimmings to help lift things further. While a 7" touchscreen infotainment system in the traditional landscape format is fitted to most models, plusher trims receive something a little different. 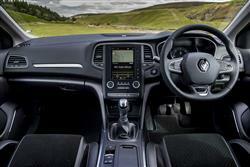 Aping the Tesla Model S, Renault offer an 8.7" touchscreen in a portrait orientation. 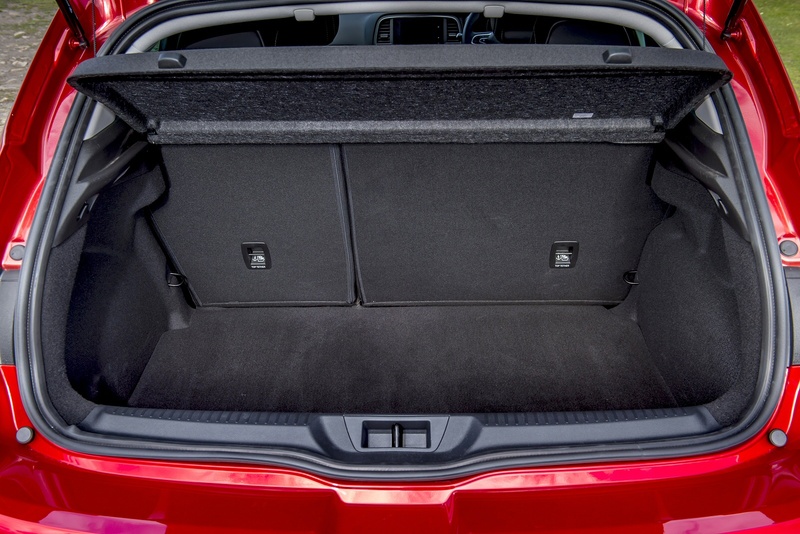 Boot capacity is an impressive 434-litres, significantly more than the class average. 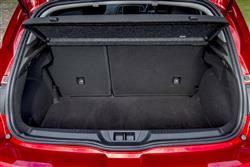 If you want more, there's a more versatile Sport Tourer estate bodystyle available with a 580-litre boot capacity and the longest loading length in the class. 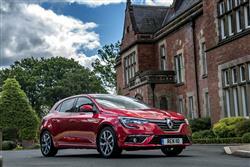 Megane buyers get the choice of a five-door hatch or the Sport Tourer estate bodystyle. Prices in the mainstream line-up range in the £18,000 to £25,000 bracket and trim levels tun from 'Play' to 'Iconic' to 'GT-Line'. 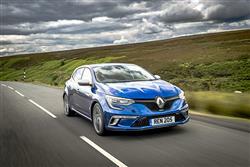 There's also the top hot hatch Megane Renaultsport variant with its 280hp 1.8-litre engine, priced from around £27,500. 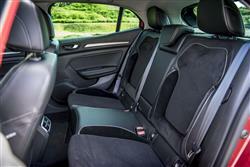 Across all these levels, to compete in the Focus family hatch segment, this car will need to be very well equipped - and is. 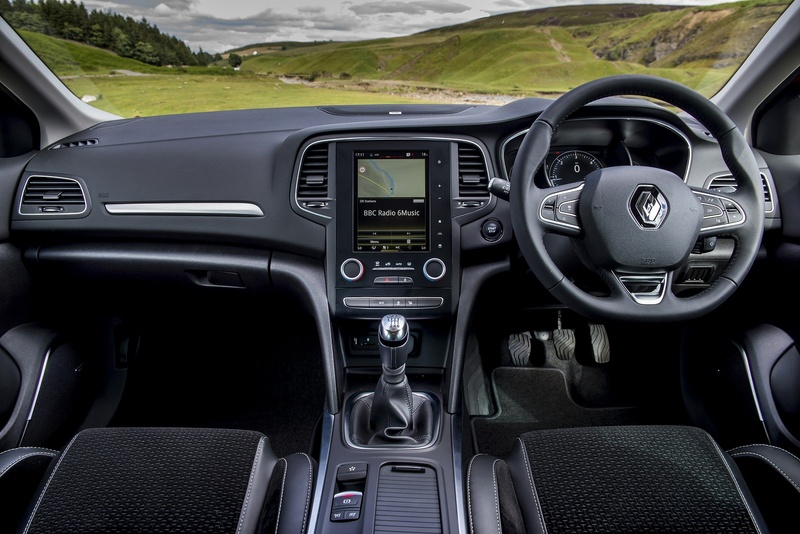 All models get Bluetooth connectivity, an automatic electronic parking brake, LED daytime running lamps, tinted windows, a 7-inch TFT instrument panel with digital speedometer, all-round electric windows, a leather steering wheel and a DAB radio with fingertip controls and an AUX input. Higher specification models benefit from such niceties as full LED lights front and rear, TFT instrument display, a driver's seat with massage function and a nine speaker BOSE stereo with an amp and subwoofer. Safety is covered by a range of available technologies on top of the usual electronic aids. These include autonomous braking for emergency scenarios, adaptive cruise control that can increase and decrease the speed of the car in traffic plus warnings for speed limits, braking distances and lane departure. Those that struggle to park will appreciate the front, rear and side parking sensors and the hands-free parking ability of higher end models. Economy and emissions figures look promising. The 1.3 TCe 140 petrol version manages up to 45.6mpg on the combined cycle (WLTP) and 125g/km of CO2 (NEDC). The 1.5 Blue dCi 115 diesel variant is capable of up to 62.6mpg (WLTP) while emitting 101g/km of CO2 (NEDC). Another aspect of purchase that should please you lies in the fact that you won't be fobbed off with the basic three year / 60,000 mile warranty that most rivals offer. 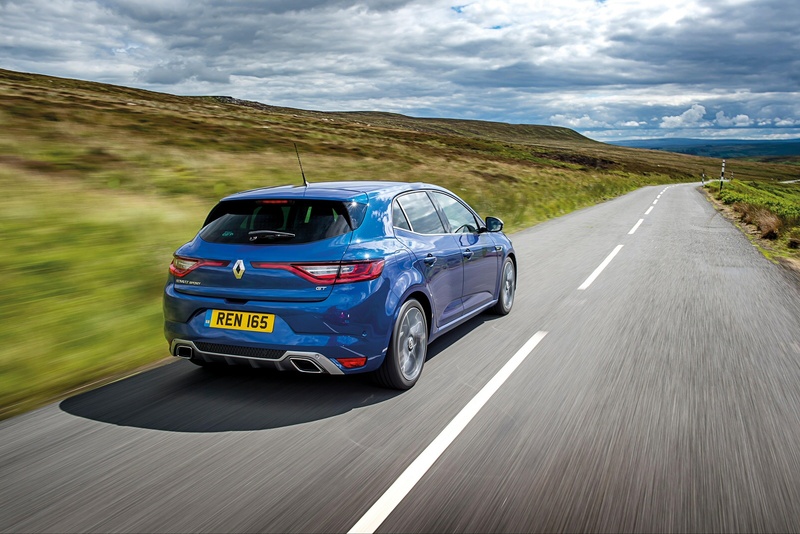 All Meganes come with a much more complete four-year / 100,000-mile warranty that includes emergency breakdown recovery. There's also three years' worth of European cover as part of this package. But will swinging depreciation negate all that hard work when it comes to totting up overall ownership costings? 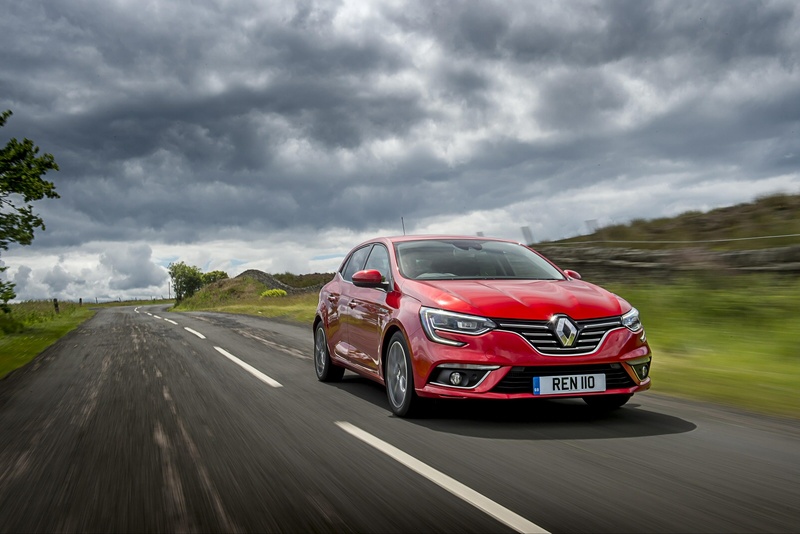 The previous generation Megane certainly didn't perform very well in this regard but Renault says that with this car, things are different. Recognising the impact of those low maintenance costings, independent experts are apparently predicting a rise of around 8% in residual values across the range. 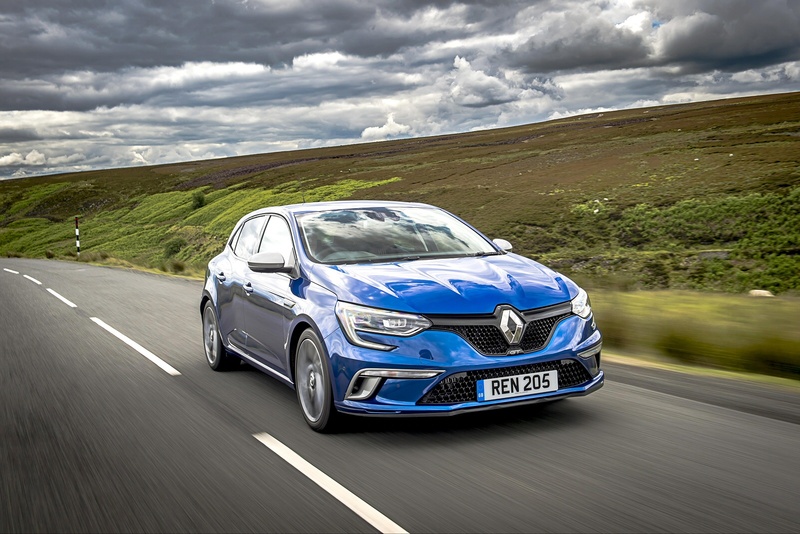 That should see petrol-powered Megane models hanging on to around 29% of their new value after three years and 60,000 miles, which is much the same as a Ford Focus or a Kia Ceed and really not that far off a much pricier Volkswagen Golf. 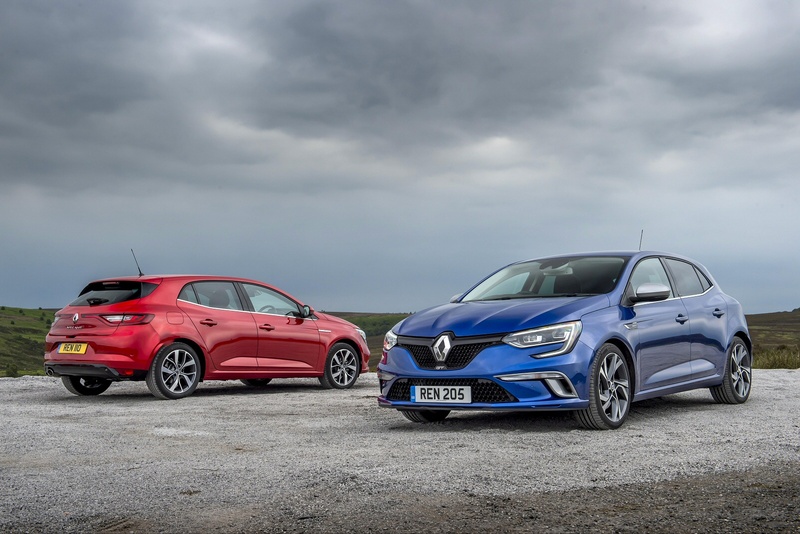 Diesel versions fare better, with the volume Blue dCi 115 model set to retain 32% of its original cost over the same period. If you�re looking for a new Renault Megane 1.3 TCE Play 5dr Auto Petrol Hatchback for sale, you�ve come to the right place. 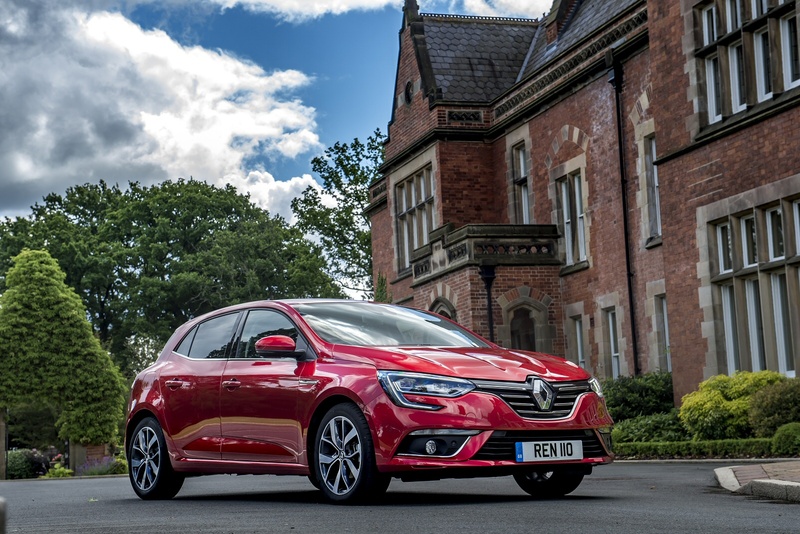 At Bristol Street Motors we don�t just have the best Renault Megane 1.3 TCE Play 5dr Auto Petrol Hatchback deals, we also offer friendly advice and help with all your enquiries to ensure your buying experience is a happy experience.